While the tradition of throwing rice and confetti as the bride and groom leave the ceremony venue is a longstanding one, other alternatives are also becoming popular. Find out all you need to know about throwing rice and confetti at your wedding. Why do we throw rice? The tradition of throwing something at the bride and groom to symbolise the future fertility and prosperity of the newlyweds dates back to Roman times, and possibly even further. The substance that was scattered over the couple varied according to country, but it was usually a local seed or grain. 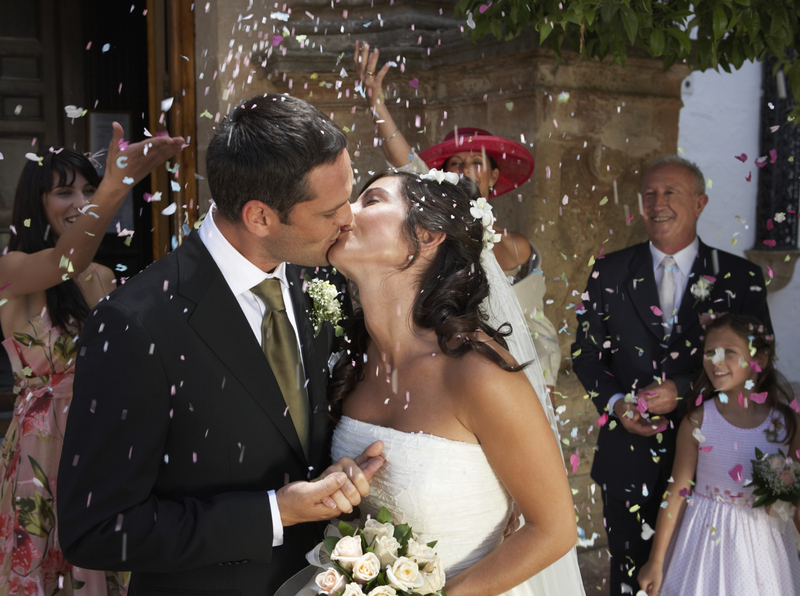 In Italy the bride and groom are showered with sugar coated nuts, or confectionary, from which the word confetti derives. As this custom evolved rice was the popular choice in America, while wheat was widely used in France. Rice is used less and less as it poses a danger if someone slips on it, or it might end up in someone’s eye. In recent years many couples have substituted rice with birdseed because it was believed that if birds consumed uncooked rice that was scattered on the ground it would harm them, but there is no proof of this. When paper confetti was used as a substitute for rice the symbolism was lost a little, but the custom remained. Confetti can be purchased in customised boxes or containers designed to match the wedding theme or colour scheme and is usually brightly coloured tissue paper, cut into tiny pieces, or shapes such as lucky horse shoes or wedding bells. Bubbles are a very popular choice if you are looking for a substitute for rice or confetti. They can blow bubbles at you in the same way as they would throw confetti. You can give each of your guests a small tub of bubble mix as they leave the ceremony, either in a simple white wedding design, or with a customised label in your wedding colours. The only drawback with bubbles is that they may mark your dress if the soap concentration is too strong. Try to get a fabric sample from your wedding dress store to see if it stains when bubbles settle on it. Another growing trend is to release birds or butterflies into the air to mark the occasion rather than having something thrown at you. Releasing butterflies is a dramatic and fashionable alternative, and this becomes most effective when each guest is given a butterfly in a specially designed box to release simultaneously. White doves are a popular choice, and you and your new husband can release one each before a whole flock are let loose by the rest of your wedding party. Rose petals are a sophisticated alternative to confetti, and this works especially well if you have incorporated roses in your bouquet, or flower arrangements, and you can use the same type and colour petals. If the petals are placed in a decorative sachet bag and hung on the guests’ chairs at the ceremony, they can also serve as wedding decorations. A final option to contemplate is giving your guests sparklers to light as you leave the ceremony. There are, of course, safety aspects to consider when using sparklers, so perhaps they are not the best choice at a wedding attended by a lot of young children. This is very effective for an evening wedding, especially during the winter when the sun sets early.